Building Castles in the Sky: Inspiring Examples and Conversations on Entrepreneurship with Eric Mouilleron. Eric Mouilleron co-founded Valtech and grew it from zero to $1.5 Billion. 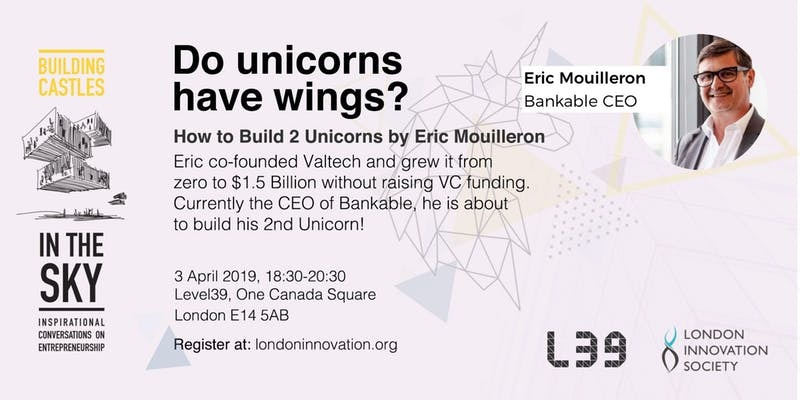 He is currently the CEO of Bankable, a European FinTech Top 100 company, and is about to build his 2nd Unicorn! Discover Eric’s steps to success and the business opportunities in FinTech start-ups to collaborate with incumbent banks, rather than disrupting them. Eric’s current company Bankable is a global architect of innovative payment solutions for corporates, banks and retailers. You will have the chance to talk with Eric in an informal setting after the Q&A, ask whatever questions you have personally. London Innovation Society thanks to CampaigUp, a WhatsApp interface for marketing and customer services, for media sponsorship. By taking part in this event you grant the event organisers full rights to use the images resulting from the photography/video filming, including social media post, youtube, newsletter and promotional material. By registering on this event you’re giving consent to London Innovation Society (LIS) to process your personal data that will only be used for future LIS marketing purposes and will not be distributed to 3rd parties in any scenario. Note: You may inform LIS that you want to be unsubscribed from LIS newsletter at any time.